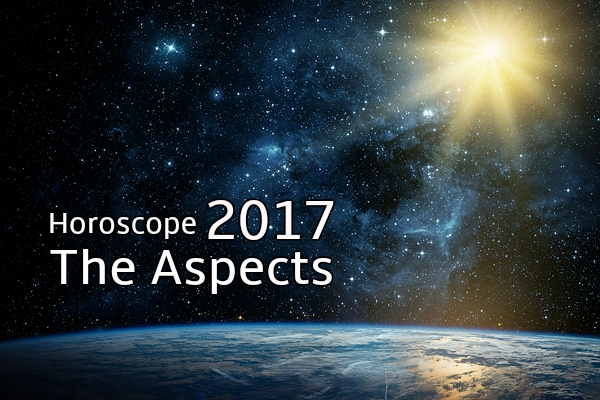 The new year is here, so let's have a look at your 2017 Horoscope and the year’s major astrological transits! A lot rides on this year! With an emphasis on cardinal signs and fire, it’s a time of action, initiative and big personalities. Jupiter in Libra (politics, gain) squares Pluto in Capricorn (power and survival) and opposes Uranus in Aries (wilfulness and revolution). We are likely to see power struggles between major players reaching far and wide. Will reason and diplomacy win? Or will it be rebellion? It could go either way when you’re under the gun! The stakes are high and, with the eclipses moving into Leo and Aquarius, old systems are failing, calling for true leadership. Changes are in store. And what seemed impossible only two years ago could easily happen this year, curtesy of Uranus trine Saturn in Sagittarius. Meanwhile, a total eclipse of the sun over north America puts the US squarely in the spotlight. 2017 is an important year for relationships both on a personal and global level. But watch out! Love planet Venus goes retrograde in spring. That's when the love that glues people together is in short supply. Venus rules money too and we could see a worsening of the financial crisis this year. Where are we headed? We're in the process of clearing away the old so we can build a new world come 2020. Hang on in there! Here’s a list of the year’s major astrological events. You can skip this section and scroll straight down to your 2017 star sign horoscope! Jupiter-Pluto-Uranus T-square: The gloves are off! Who or what will prevail? Saturn trine Uranus: Positive change and progress. Dec 2016, May 19th, November 11th 2017. Saturn square Chiron in Pisces: The dark side of authority figures. Jupiter sextile Saturn, August 27th: Solid opportunities for growth, gain and lasting success. Venus Retrograde (13 Aries-26 Pisces), March 3rd-April 15th: A challenging time for relationships. A triple square to Saturn January 29th and April 9-22 could bring icy conditions! The Eclipses move from Virgo-Pisces into Leo-Aquarius (alongside the Lunar Nodes from May 9th). This marks the end of ideological systems that ignore the individual. The world now cries out for charismatic leadership. Here are this year’s eclipses. Jupiter in Libra / moves into Scorpio October 10th: Jupiter brings great opportunities to October-born Libras in the first nine months of the year, and then to Scorpios, again born in October or early November. Jupiter trine Neptune: a mystical, compassionate, artistic and inspired vibe that takes hold by year’s end (Dec 2nd). Mercury Retrograde, Earth and Fire: Times to re-envision your life in the face of practical concerns. 3 - 23 December 2017 (Sagittarius) *Note that Mercury meets Saturn in the last zodiac degrees of Sagittarius in December, which are reputedly associated with market crashes. Watch this space! If you want to dig a bit deeper and get exclusive tips on your personal horoscope, what you need is your 2017 Personal Forecast! What does 2017 have in store for your star sign? Here’s our little horoscope teaser. Check back in for your full 2017 horoscope and 2017 love horoscope coming soon! In the meantime, why not get in touch with one of our stargazing experts on 0207 111 6384 for a one-on-one personal reading for the year ahead? This is a decisive year for the things you want, dear Aries and for your career and relationships - especially if you are April-born. You will be forcefully engaged in asserting your independence against bosses, partners and competitors. In this process, you will be able to give your life new meaning in line with the new and improved you. Other people will be a powerful driver for growth and you will see many changes in your community. This is also a year when you can open up to love or bring more of yourself into the world, through a creative project or other enterprise. March-April should find you rethinking relationships, priorities and attitudes. Avoid plastic surgery at this time. Your August horoscope brings an opportunity to make a relationship official. By year’s end, your or someone else’s generosity knows no bounds. This year brings great initiatives at work and changes around your lifestyle, health and daily habits, dear Taurus. Have you lost your work-life balance? Time to do something about it! You can release the past, overcome bad habits and open yourself to a new way of seeing things. 2017 could also see you perfecting your skills and working to expand your influence. Your subconscious desire to be free of the past and transform your life finds the road to change open this year. Changes at home urge you to recalibrate your compass and find a new north. You may move house, change career or have a family of your own giving you a new life direction. Your horoscope ruler, Venus, goes retrograde March-April. This is a time for introspection, to reconnect with old friends and re-evaluate old ideals. August helps you establish better health or earn a bonus. By year’s end, you enter a time of rewarding relationships, both personal and social. This year looks like one big party, dear Gemini. It’s a year of networking, travel, expansion and communications galore that brings multiple opportunities for love, fun and self expression. A creative project involving big money and eccentric allies may consume you entirely. People are far more willing to help you realise your dreams this year! Love also rocks your world. You’re feeling frisky and eager to live a little. Are you lovers, business partners or just friends? All of the above? Trust may be an issue and joint finances may spoil the party at times. You’re certainly playing for big stakes this year! You will need to hold your nerve. You’re on a fabulous learning curve and your world will expand as a result. Your March-April horoscope urges you to rethink love and friendship, goals and worldly ambitions. August helps you cement a love relationship (or labour of love). A secret benefactor assists you professionally by year’s end. This is a highly eventful year, dear Cancer, when you have everything to play for: money, career advancement, home, family and relationships are all due for major developments. Trying to accommodate others’ demands while you pursue a more fulfilling family life alongside your professional goals will drive you forward. You will need to be like the charioteer pulling these disparate forces together. Your 2017 horoscope indicates a career breakthrough is possible. So is a house move. But the biggest changes will be in your finances. Events surrounding your income, assets, debts and financial agreements will change your financial landscape by 2018. March-April sees you re-evaluating your worldly goals from a wider perspective. August helps you build stability at home and do well at work. By year’s end you are eager to enjoy life, find love and express your creativity. The Universe agrees and is on your side! This year has the capacity to transform you inside out, dear Leo. And this will open the way for your relationship landscape to change. Single? You may not be for much longer! Time to change your relationship status. If you’ve been seeing someone casually, you may want to make it official. You’re finally loosening up, having more fun and letting love in. The majority of your focus and effort this year will go into making space for new experiences in your life. You are likely to travel a lot, meet new people and establish new habits. You may also be on a search for meaningful work that gives you freedom of movement and food for thought. March-April could see you reconsider where a relationship is going and how close you can get to that person. Your birthday horoscope in August brings solid romantic and creative opportunities. By year’s end you’re ready to open up emotionally. This is an intense and transformative year for you, dear Virgo. You may be feeling like you’re literally putting all your eggs in one basket, as you throw yourself completely into a new love affair or invest everything you’ve got into a new creative project or business venture. You’re developing greater self-reliance and independence, but things are uncertain and your horoscope highlights a high risk-high reward year. The good news is that your household finances are changing for the better and you can make fast progress with a real estate or family matter. Big changes on a subconscious level will eventually manifest in lifestyle changes. Work will be eventful with lots going on behind the scenes. Don’t stress and take extra care of your health. March-April brings a reevaluation of a close relationship. August helps you solidify your finances and invest more in your home and family. By year’s end others are a source of inspiration. This is a year you’ll remember, dear Libra! Jupiter brings fantastic opportunities to go after everything you want. It may not feel perfect. But whatever you are struggling against, you can grow exponentially in 2017 and find greater happiness. Others continue to be difficult and you may feel you’re up against it at home or with a family member or real estate situation. But the things you set into motion this year will keep you going for a decade to come. Get ready to make lots of new friends and even fall in love! Changes in your community unleash your creativity and bring out your fun-loving side. You’re ready to live life to the fullest! A cool breeze in your horoscope in March-April urges you to re-evaluate the way you come across and relate to others. August helps you establish a greater influence. By year’s end you’re ready to cash in on your skills. Your 2017 focus is largely on your work and professional life, dear Scorpio. Expect big changes in your career, public image and life direction that will eventually also impact your family and household. Much of your time could be spent trying to reorient yourself and find new ways to function as a result. This might be due to a new job, new staff or new technologies. Or it might be with your health, where you could make a real difference by changing your daily habits. You can achieve a lot at work this year and even perform miracles when it comes to your health. This will strengthen you physically and financially. March-April could see you reevaluate your lifestyle and working relationships. August brings opportunities for financial gain. Then your horoscope heats up in the autumn. Jupiter in your sign from October 10th brings you luck and initiates a new decade of growth! Get ready to fall in love with life all over again! The pressure is off a little this year, dear Sagittarius. An inspiring love affair or new creative venture allows you to step into your new, bigger shoes and shows you just how much you’ve grown and matured. If you’re working on a labour of love, you’ll need friends and allies to get things off the ground. Meet them half way, your horoscope says. Don’t be a diva. This has the potential to transform your financial situation. It will be intense, but you can do it. You’re on a steep learning curve and you want to make your life more than it was before. You may travel more as a result, go to university, publish your work or decide to extend your business reach. A past lover could send you on a trip down memory lane in March-April. August helps you win valuable allies and by year’s end you are ready to put the past behind and start your new life. You’re in the midst of an incredible transformation, dear Capricorn. This involves your personal and public image and your finances. A lot is riding on how you handle the tensions between your worldly goals and personal life. You are treating yourself like a real VIP and reaching for the stars this year. But inwardly there’s instability and tension. That’s because your home and family are undergoing changes, which may be refreshing but are also unsettling. You can embrace change this year and just go with it. Facing your demons just seems to be easier this year. Your finances are also due for a major overhaul in 2017. A partner or financial agreement could be instrumental in kick-starting this process, your horoscope says. March-April puts a strain on personal and professional relationships while August brings opportunities for recognition. By year’s end you’re ready to become part of an inspiring social network and make new friends. The headline news this year is that eclipses arrive in your sign, dear Aquarius. Expect major changes in your relationships with others, which will in turn change how you see yourself and how you approach life in general. This is a year of growth, much travel and learning, when you can expand your influence and share your ideas. Your voice is getting louder and this may also create some powerful enemies. These may even be your own personal demons coming to life. Much will depend on how psychologically aware you are and how well you can handle these energies. Stay sane! Your good horoscope news is that collaborative projects will go well this year. You have the respect of your friends and that gives you greater creative freedom. March-April could see you review certain ideas from a financial perspective. August could help you realise a far-reaching dream. By year’s end your career is ready to take off! Last year was intense, dear Pisces. Now your efforts to fulfil your responsibilities start to pay off, bringing positive career and financial developments. Get ready for big life-style changes! You may be going back to work, changing jobs, undergoing therapy of some kind or going on a major offensive to lose weight. These events could change the way you function at a deeper level, signifying the end of a life chapter. A lot of your energy will go into your finances this year. There may be power struggles around what you put in versus what others bring to the table in the face of external pressures. Nonetheless, this is a good time to work toward an ambitious, demanding project with others, because you can achieve a lot together. March-April sees you re-evaluating your priorities and August helps enhance your professional credibility. Your horoscope takes on a more escapist hue in the autumn and by year’s end you’re dreaming of distant horizons.